Jungle Red Writers: Messy Desk = Creativity? LUCY BURDETTE: I've been thinking about messy desks. Though I can clean up my office when I've finished a project, while I'm writing a book, my desk is a disaster. And unfortunately, my office is a little nook just steps from the bed. There are books stacked around the bedroom, papers strewn on the nightstand, and a teetering pile of scraps and articles and drafts on the desktop. And since I like to work in bed, we often have to shovel a big pile off John's side before he can get in at night. Even though I no longer practice as a clinical psychologist, I still belong to my professional organization and enjoy keeping up with the latest research and trends. One of the headlines in the October issue of the American Psychological Association Monitor blared: "A messy desk encourages a creative mind, study finds." The researcher found that "working in a tidy room encourages people to do socially responsible things...But working in a messy room seems to help them try new things and come up with creative ideas." What a relief! Justification for my chaos! How about you Reds? Neat or messy? HALLIE EPHRON: My office is small (about 8x10) so I can't let things get too out of control or I'm paralyzed. Right now it's middling messy. When things get too out of hand I go into a mad straightening frenzy. Then relax until it's driving me nuts again. That pile on the floor is my TBR pile. It's scary, so I try not to notice it. And you can't see, but a note on my desk says "Why was he killed?" I do not know the answer. Yet. I try to surround myself with good karma. So on the shelf over the window, there's the green glass swan I picked up on eBay after Never Tell a Lie was published, along with my lucky feather collection and my favorite slinky. On the wall is my Edgar nomination with a wooden cat I grabbed off at Kate's Mystery Books' final yard sale, and pictures of my wonderful daughters. HANK PHILLIPPI RYAN: Whew is right. Organized-messy. But I know where everything is, absolutely. I use the "piles of files" system, and it works admirably. FIles on the chairs, files on the couch, files on the floor, files on the desk. Marketing is on the dining room table, I admit. I think the good karma thing is important, too. On my desk I have a rock that's etched with "imagine" and "patience"--ooh, I need to remember that right now. There's also a bottle of wine from Sue Grafton, and see? my Agatha teapots (and Emmys) are on the shelf. Reminding me things CAN work. LUCY: I forgot to say, though I've been nominated for Agathas, I've yet to come home with the prize. But you might be able to see in the upper right hand corner of my photo a tiny little teapot. Krista Davis gave these out the year several of us were nominated against each other--she thought we all should go home with a teapot! Sweet! RHYS BOWEN: I'm organized-messy too. When I'm writing I build a wall of research materials around my chair so I can swivel and grab what I need without getting up. I also have my award nominations framed on the wall above me so I can look up on despairing days and say "Wow, I really did get that Edgar nomination. I can't be so bad after all." But I have to confess that I do have a variety of toys to play with when I need distractions--my Edgar Allen Poe doll, one of those picture cubes with Monet paintings, a spinning hologram thingie, wooden animals, a stuffed cow that moos.. and there are more. But the one way that tidiness has improved recently is using Sticky Notes and Evernote on my computers and iPhone so I don't need endless paper to-do lists. DEBORAH CROMBIE: Ha ha, Hallie, you're only seeing half of the bookshelves to the right of my desk--those are my TBR shelves. Too scary to contemplate, although better than they were, as this summer I purged two-thirds of the books. SUSAN ELIA MACNEAL: I'm going to confess that not only do I not have an office, I don't even have my own desk. While the hubby and I used to have a home office, when the kiddo came along, it became his bedroom. Right now we sort of share a desk in our dining room — expect it's really the husband's — while I tend to work on a laptop in cafes, the local library, our sofa. Mostly the sofa... 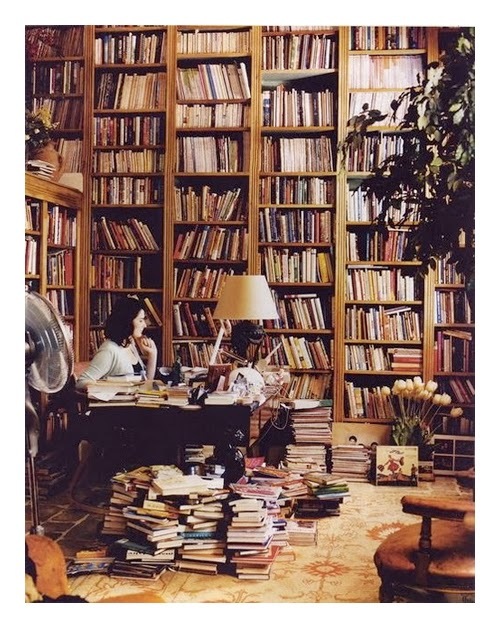 In my fantasy life, though, I have a library/office that looks like Nigella Lawson's. LUCY: How about you Reds? Are you mess/creative? Any tips for keeping the chaos in check? I definitely live in the messy camp . . . I must admit that I like stuff and my idea of neat [in a manner of speaking] means I can find what I need somewhere in the piles of files . . . . As for keeping it in check, I’m a fan of storage boxes, cute catch-alls, and that sort of thing . . . . I have abandoned the upstairs office for a new concept of "work space." I now marshall my forces in a recliner in our TV room, fireplace crackling, computer in my lap, stock market tape silently passing, refrigerator close, the dog and the cat now visible when they need to go outside. I am in control of all that I see ... well, except stock prices.I miss my messy desk but all the tidbits and notes are on my computer these days. I am a bad example. I have a dedicated office, with bookshelves, filing cabinets, big desk, etc., that no one but me uses. It's not enough, so now I have crossed the hall into my son's ex-bedroom, which I am converting into a writing room. The office is a mess. The writing room is neat...for now. Give me time. Lots of creativity here with you guys!! Wow! I had no idea I was so creative:-) I know where everything is on my work desk, as crowded as it is (and it spills over to the bookcase up against the wall behind me). At home, the entire condo IS the desk. I think I can probably now stop apologizing for all the desk-type clutter, the books shoved into bookcases any which way, the piles and piles of folders, the piles of papers waiting to be filed in those folders,the boxes of papers that must be cleaned out, with saved items filed (in those folders,or in the folders that actually made it into the filing cabinets). I appear to be in good company here! My, my, aren't we just the messy bunch? Yes, I admit that I'm a messoholic also. Straighten things up and I start losing things. Happens every time. I have a tendency to "spread," so I must always work toward containment, if not organization. Definitely in the messy camp. Perhaps because, during breaks from the computer, I'd rather stare out the window at birds flitting around my bird feeders than file??? Deb, your office is painted the same color as our kitchen. Such a soothing color, isn't it? 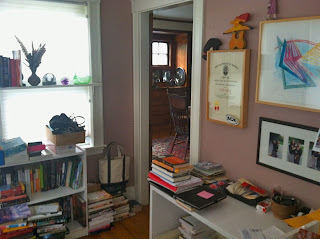 When I was writing full time I had to have all my research strewn around--in organized piles, but every horizontal surface in the immediate area was covered with them. It was impossible to do anything else in that space, and woe be to the family member who invaded or dared to move anything. Charley Harper, the late and wonderful wildlife artist (using geometric shapes--he said other artists painted each feather; he painted each wing), was a family friend who lived here in the Cincinnati area. He had a studio that was absolute chaos, by design (at least that was his story). He told my husband once that he often got his best ideas from the accidental juxtaposition of objects, that it stimulated his creativity. Who can argue with that? He was tremendously creative and successful. Laughing at Jack Getze - because did I say I actually WORK in my office? Sure, sometimes. But I also take my computer out to the living room couch or up to my bedroom or outside to the patio on a nice day. Katie Beer - I keep a slab of cardboard with yellow post-its stuck on it to keep track of my plot. No room for a white board. Katie Baer, I tape sheets of printer paper together and write out color-coded story lines. I don't really have a place for a corkboard, and with the printer paper you can always add another piece in vertically or horizontally. The bad thing is that you can't move events around, but, for me, it seems to brainstorming part of working out the event progression that's important. And I must say, none of those desks actually looks very messy to me, you know? Is that just me? I definitely use the dining room table, not that I own one. I live in a condo, so what I have is one of those nifty bar tables with tall chairs. But same diff--paper-laden! I have my official office, with desk, printer, etcetera (west-facing), but then also a desk in front of the picture windows in the living area (east-facing). books everywhere, sketchbooks all over the place, even my art table in the basement is a mess! I think I am to the point that it's way over crazy that I need to try to organize again(try being the key word). Hallie, love your tip of using a big piece of cardboard for sticky notes. I was using the back of my door,but they keep falling off. Hank, I did not want to say it, but certain people seemed to have CLEANED UP THEIR DESKS before they sent their photos in. Organised chaos. Well, semi-organised. But I do have to keep a certain area of open space on either side of my laptop, just to keep from being distracted by all the papers that would spontaneously generate there if I took my eye off them for a moment. I do enjoy seeing other people's desks. And NO ONE wants to see one that's pizen clean. Clearly not a workspace, but a magazine layout. I used to have a sense of where in a stack anything was, but as my work space gets crowded out by stuff from other sources (I'm still going through boxes and boxes of family stuff, not to mention 40 years of dead legal files that need to be sorted before they can go to the shredding company), I tend to build higher and higher stacks until an avalanche precipitates a cleaning binge. Then, for a while, everything is neat.... That never lasts, though. Still, newly discovered objects stimulate ideas for essays, articles and stories. So I guess the junk is a good thing-- but only to a point (and mostly, I'm well past that point, alas). PS - Katie, for my post-its and story-outlining, I buy tri-fold cardboard display boards (about $5) at Staples. I can map out my stories, set the board up in the room while I'm working, and then when I need the space, fold it up and tuck it behind my desk or against the wall. Because it folds, my post-its don't fall off, and also because it folds, it can stand up on its own wherever I am working. Excellent tip, Kim. I'm going to get me one of those. I have a few, Brenda - I keep them stashed under my bed when I'm not using them. I heard about that study a few weeks ago on NPR, if it's the same one Lucy mentioned, and have to say the methodology seemed odd -- even suspect -- to me. Participants were judged to be creative by whether they chose to try a new thing (creative, good) or a familiar thing (dull, bad) after being in a messy or neat room. Makes no sense to me. I like lots of stuff around, too, but I like it organized -- probably b/c I've spent 30 years practicing law, where files must be organized or Bad Things Happen, and clients -- and managing partners -- often drop in unannounced! Asymmetrical piles of files organized (shoved) into zones. I'm going to have to try out Kim's -- rather Staples's -- trifolds. That sounds perfect. Right now I use colored index cards, one per scene, color-coated by POV character. It works, but...to see what I've got I have to lay them out on the floor, then pick them back up so that the cat doesn't tear them to shreds, etcetera. I have a white board, too, that sits on the console table in the main living area. It's the only place for it. Not so elegant. Megan Ryder, another friend of mine, uses the trifold boards along with specific colored and shaped sticky notes to indicate plot points and narrators. Check out her blog post about her process: http://meganryder.com/2013/10/storyboarding-for-success-part-3-fun-with-post-its/ Lots of great ideas. Oh, suggestions. Binders for each ms. and for the Bible for each series. For the Village series, I covered an old piece of foam core --a left-over trial exhibit, before they all became computerized -- and pin images to it. For the Spice series, I borrowed an idea from -- hmm, Deborah? -- and started a sketchbook for notes, sketches, images I've stuck in there with a glue stick. And each series has a basket on the floor for maps, magazines, tourist brochures, etc. The spice series? Leslie, do we know about this?? I suspect when you're busy being creative it's easier to let the space get messy so you can focus on writing. I'm sure that's not true for everyone. I have friends who can't create unless things are neat. For some of them that means low word counts. I think the research on the relationship between messiness and creativity might be flawed in that the subjects were invited to participate in the research that took place in the researchers' messy or neat environment. The need to conform or the desire to please might have been induced by the environment they were presented with. In their own space they might behave differently according to their personality preferences and not their performance in reaction to the research conditions. Of course, it's messy! . . . and that's the way I like it! The teacher for the gifted program used to tell parents that a messy room was a solid symptom of creativity . . . dashing off to one new pursuit after another. My first bosses after college were of the piles of work philosophy -- I was carefully instructed in how to dust and replace piles exactly. The cleaning crews were not allowed to touch their desks. A later manager preferred a clean, organized desk with just a pad of paper and a pen (of course, his secretary's space held all the clutter. I wanted to get a sign for the office: If a cluttered desk is the sign of a cluttered mind, what is an empty desk the sign of? Patricia McKissack told us that her "Messy Bessy" book was inspired by a comment by a custodian in their office . . . and the McKissacks have written many wonderful books! Reine, I think you're right. I'm very distracted by mess. I think it's an ADD issue, not a creativity issue. Kim, the tri-fold board sounds great! Am definitely going to check that out. Too late for the book-in-progress (not doing all that story-boarding over again!) but I'll certainly consider for the next one. Lucy asked: "The spice series? Leslie, do we know about this??" The Seattle Spice Shop Mysteries, set in the Pike Place Market. #1 is tentatively titled Spiced to Death, and set for pub in March 2015, from Berkley Prime Crime. And Reine, yes! 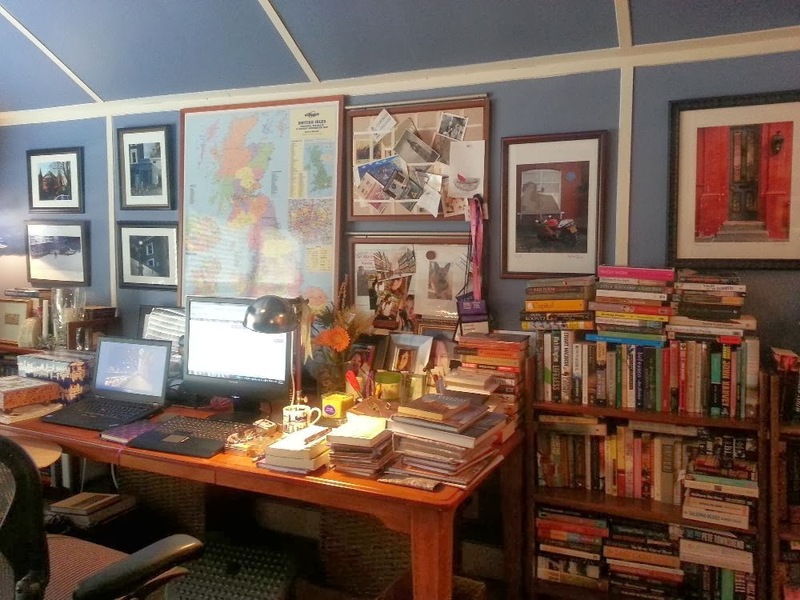 Someone else's messy space would be impossible for me (e.g., Mr. Right's office), but my own makes perfect sense! Debs, I like the ADD concept. Makes sense. Right now I'm in modus WriMo, so my writing space after week two is chaos. Leslie, your spice series sounds delicious and a little scary. Spices have scared me since people started hiding their marijuana in the oregano jars. Edith Wharton, too! Worked in bed. She'd drop her pages on the floor...and the maid would pick them up and take them to the typist. Oh, yeah. That's the way to do it! No matter what way I say it, somehow my saying I love working in bed doesn't come out right. But I do love working in bed. It's toasty warm in the winter and there's a fan overhead in the summer. I do best when I'm comfy. The only problem I have working in bed is when my cat decides to sleep on my face. And what did I get out of all this? That Rhys Bowen has a stuffed cow that moos. Total envy. Love this blog! Now I don't feel so embarrassed by the mess in my library/dining room/ office. When I'm having anyone for dinner, I need to shovel everything into boxes and hide the piles of boxes under a blanket or tablecloth. Then it's finding everything afterwards. I like the idea that it means I'm creative. Six months ago I purchased four Barrister bookcases for my office. I moved everything around to give Hubby space to put them together. HUGE MISTAKE! Hubby put the bookcases together, one at a time, in the living room and moved them into the office. I have all the nonfiction books in the four bookcases but everything else I moved is still a disaster. I can't find anything. I don't have space to work on anything. I was better off with all the piles of book and everything else where it belongs. I'm working on my NaNoWriMo project of my laptop in the living room and my personal bills, checkbook, etc. now sit on the corner of the kitchen table. I worked better in my crowded office. Can't wait until I finish NaNoWriMo and can get in the office. I have got to get back to my organized ciaos. In summer I work at a table at the dock. Love to work on the waterfront. Funny part is it's just me and my AlphaSmart...no ciaos, so why do I work well there with out my piles of stuff?